I went to Isaak's conference alone, since Daddy was at Mica's conference. This was taken this weekend when he was watching The Young Indiana Jones. Isaak's had the opposite teachers than Mica had. Each one is new. I'm hoping that tradition will happen next year. Mica's 2nd year teacher didn't push him nearly enough. The not so scary scare crow. Hi! My name is Nike. I am so tired standing outside waiting for the crows to come, so I can scare the crows away. 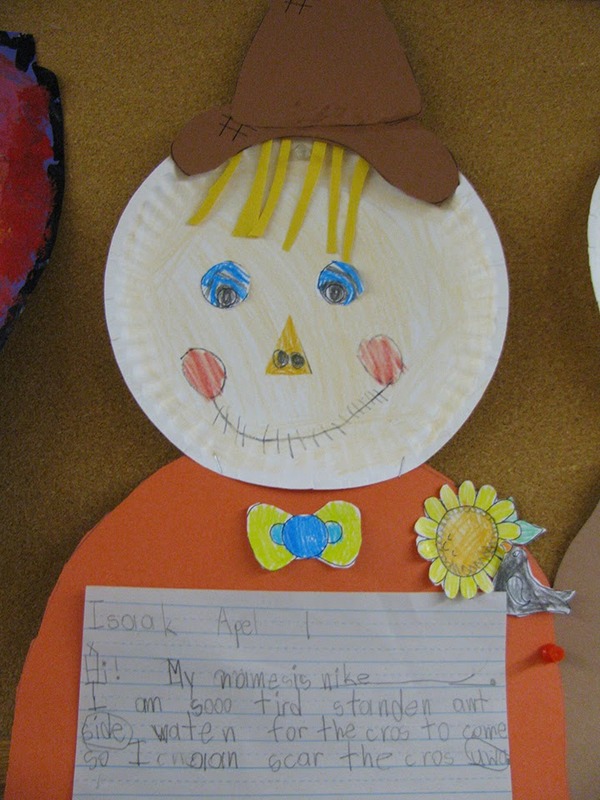 Isaak goes in streaks with liking certain things in first grade. Earlier this year Isaak was big into numbers. He wrote numbers all the time, and worked in his Go Math workbook. Isaak convinced me that despite what I hear about the negatives with Common Core there is good in it to. You see Isaak gets math because of Common Core. It's visual, and he thinks like me; in a visual way. I strongly think whenever there's a negative with something, there's a positive to. The yin and yang theory. A few weeks ago Isaak got into writing. Math sort of got pushed aside, and writing was his thing. He wrote a 5 page story, then a 1 page story. At school he wrote a story about a bear. His teacher said he's really excited about it. They've been talking about rough drafts, and move onto final copies. I couldn't take his story home, but wanted to. I had to ask his teacher if the bear got ran over by a car in the story? She looked at me funny, and I told her about how Travis AKA Daddy ran over a bear with his car this summer. For the record Isaak didn't have his bear get ran over. Lately Isaak wants to read. This is new. Before I couldn't get him to pick up books, unless I read to him. I told his teacher that he probably didn't want to read to me because he was afraid I wouldn't read to him if I knew, he knew how to read. Isaak's not in the gifted program this year. Maybe next year. That's perfectly fine with me. 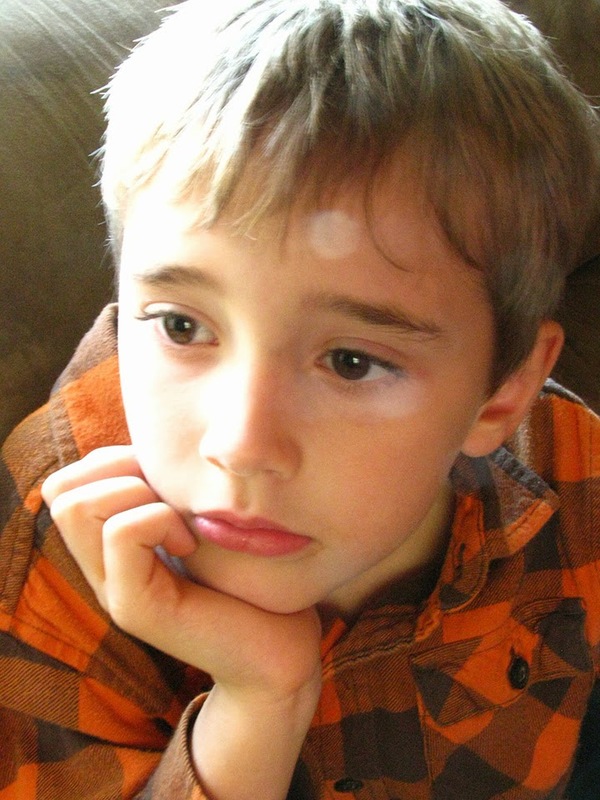 He works hard, tries hard, and comes home with good behavior dots every day. Isaak hangs out with a kid named Jacob mostly. Jacob is a good kid. Isaak's really ultra silly around him because it makes Jacob laugh. Two of Isaak's friends are no longer in class with him. I think most kids like Isaak, but he's stand offish with friendships. Isaak likes to play with girls because many of them are good students, and nice. They don't want to play what he wants to play, which is superheros. He's kind of in limbo land for friendships. Isaak wants to be one of the good kids. He feels like school is his job. This is the stage where making friends can be difficult. Kids need to find out who they are before they can make a relationship last. I remember my 11 year old kept chaining who best friend is. She now has a really close friend who has been consistent over the past 2 years. Time will tell. He seems like he is doing amazing. Enjoy it - first grade is a fun year. My little one had a good time last year because it was a transitional year since they came up from kindergarten. 2nd grade is a bit tougher. Oh that's fun to see their development as the years progress. Both of my daughters loved school but in different ways and reasons. I love the scare crow! Such a cute decoration to save and put up each year! I hate it when they are in friendship limbo. Mariah seems to be stuck that way all the time. As soon as I think she's made a good friend, she dumps them and moves on to the next. She is just too mature for girls her age and gets annoyed by their petty teenage drama. Allison wants everyone to be her friend and can't handle it when someone doesn't like her. 2 very different kids lol.